Shani got the pin on Pimpi. Taya came to the ring after the match and Shani challenged her for a title match. 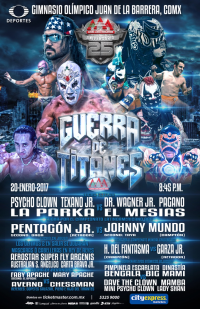 Taya, Mundo, Mesias instead beat up all the rudos. Earlier, Bengala did a moonsault of the upper level. Xinetez helped OGT win, but said their would be a price to pay for their help. Moved down a spot. Daga entered himself into the cage match (maybe to beat Australian Suicide again; it wasn't made clear.) Order of escape was Carta Brava, Argenis, Angelico, Daga and Australian Suicide. Aerostar and Super Fly were the last two and ended up bloody. 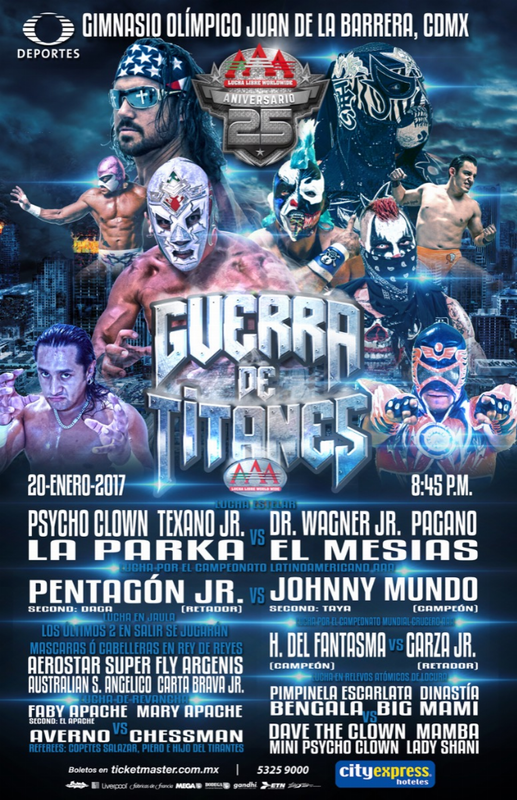 They advance to an apuesta match at Rey de Reyes. Moved down a spot. Monster & Murder helped Wagner win. Pagano and Mesias had issues. Moved up a spot. Taya got involved often and hit Pentagon with a light tube to win. 2nd defense. Daga demanded a title shot. Mascara de Bronce beat Mini Psycho with a Spanish Fly. Parka Negra replaced Apache. Rudas won thanks to a Chessman distraction on Fabi. 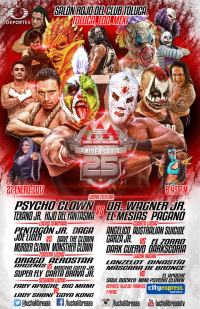 Averno & Chessman replaced Daga & Pentagon on 01/23 and this was moved down a spot. Fabi distracted the OGT team, leading to Monsther beating Lider. Lider & Kahn-Del-Mal were still wearing Perros del Mal shirts. Averno blamed them for the loss and mocked them for being left behind. Los Totalmente Traidors (which now appear to officially include Dave) tried to interfere. Piero kicked them out, and Wagner told them to go. 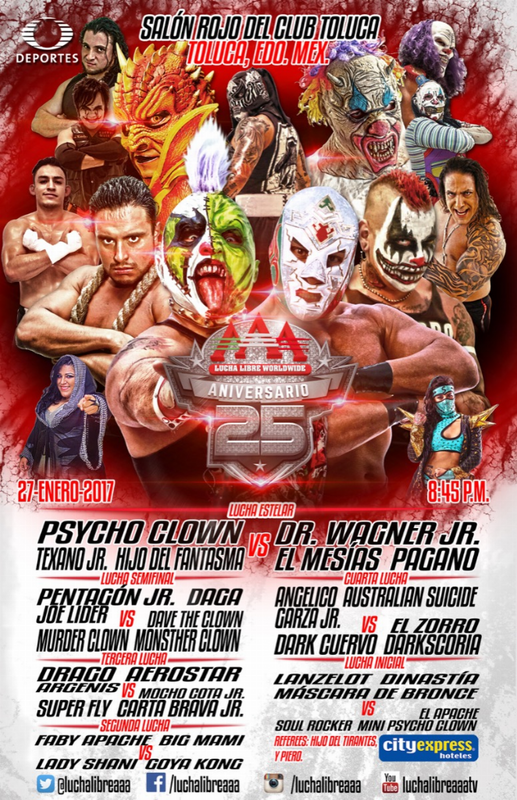 Psycho Clown beat Wagner after fouls both way. Mesias & Pagano had problems during the match. Event Notes: Moved from Gimnasio Agustin Millan to Salón Rojo del Club Toluca around 01/02.